Microblading is the latest beauty trend to hit the United States in decades. This 4 day intensive course focuses on hands on training, basic and advanced techniques, color theory, eyebrow design, and lot’s of practice on live models. We’ve designed this course to cover all facets of eyebrow microblading by hand and machine. Our state of the art Microblading and Permanent Makeup school exceeds all state and county health regulations. We pride ourselves on providing the highest quality standards in the Microblading industry. 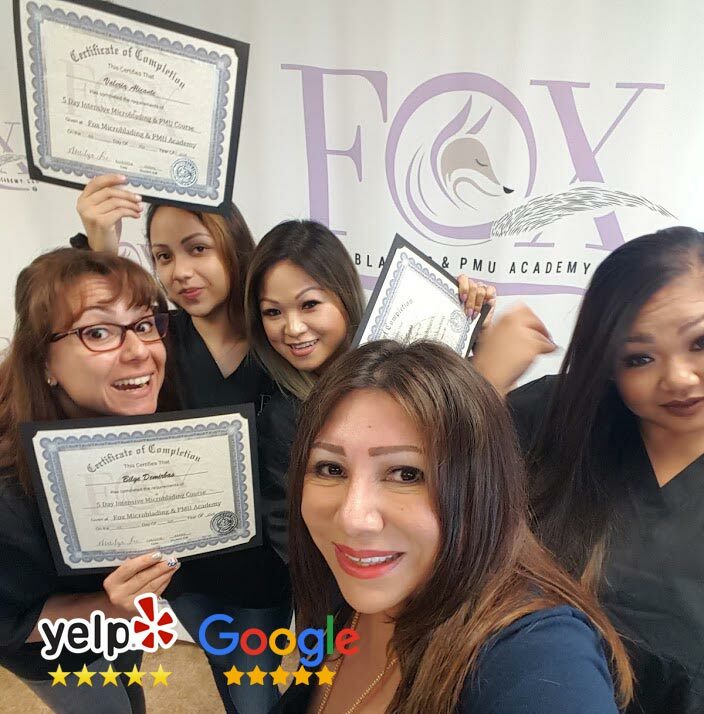 Find out why Fox Microblading & PMU Academy is the best choice for learning Microblading & Permanent Makeup. Our courses feature only 4 students per class and a luxurious procedure room that resembles a spa more than a training school. Enjoy soothing water fountains and relaxing music while you practice microblading on live models. We’ve thought out every detail so that you can get the most out of this unique learning experience. Our proven learning system is packed with knowledge and hands on training. Our class sizes are limited to only 4 students per class. Here’s a quick summary of what you’ll learn. This includes everything needed to learn Microblading. Our courses include your bloodborne pathogens certificate, a complete microblading kit with premium supplies, premium inks, a school uniform, and of course your Microblading Certificate. We have thought of everything to create the best Microblading Certification Course in Orange County. Our students and models love us. Our curriculum is developed to provide you with the highest quality microblading education in the market today. Read our reviews and see why students and models love Fox Microblading & PMU Academy.